There is a song by Perry Como that goes “Catch a falling star and put it in your pocket, never let it fade away. Catch a falling star and put it In your pocket, save it for a rainy day”. We all need a bit of light on a rainy day, but most importantly, we need to remember and hold on to the things that give our lives light every day. 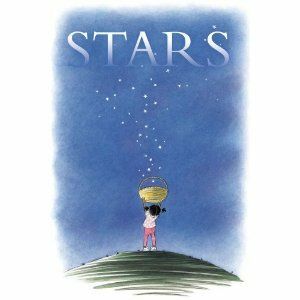 Stars, a picture book written by Mary Lyn Ray and illustrated by Marla Frazee, reminds me of Perry Como’s song because it is all about holding on to the stars in our lives. We might not be able to literally catch a fallen star, but you can draw a star on a piece of shiny paper and put keep it in your pocket. A star holds its own unique magic. It can make you a sheriff or the bearer of a wand. You can give a star to a friend or feel as shiny as a star. Stars, like joy, are all around you if you only look. I was attracted to this book because I liked the message that stars are a literal and metaphorical light in our lives. I also loved the idea posed on the last page that sometimes you have to wait for dark to see the light of the stars. I don’t know if the author meant what I got from it and I don’t think that a lot of kids will catch the subtext of the words, but it a beautiful thought for anyone who has seen some literal or metaphorical darkness in their lives.